After two years away, Raudrich returns to his home on The Isle of Eight Lairds to resume the duty he's pledged his life to. When he arrives, he finds an out-of-time lassie asleep in his bed. The woman intrigues him, and it doesn't take long before she captures his heart. But something inside causes her to resist her feelings. If only he could help her love herself, perhaps she would have room in her heart to love him in return. As their feelings grow, so does the strength of an evil held captive beneath the castle - an evil that will do anything to escape. Will Laurel open herself up to the possibility of love? If she does, can she find the power within herself to outwit the evil she's destined to face? What did you love best about Love Beyond Words: A Scottish Time Travel Romance? 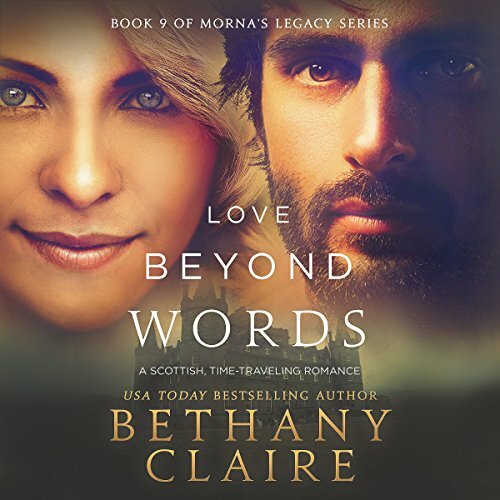 What I loved best about Love Beyond Words was that it surprisingly took the Morna's Legacy Series in a brand new direction. I loved how it took two new characters who were introduced in Love Beyond Reach and transported them to the 17th century to a new part of Scotland with many new characters. I loved how the new story had elements of both Morna's magic that we're familiar with and combined it with magic from new sources including some super natural characters. Lily Collingwood took an eBook that I had already read and fallen in love with to new heights! Right from the beginning- the way she articulated the conversations between the two sisters was so real. It reminded me of wonderful talks I've had with my own sisters. Bethany Claire had introduced several new characters in this book. Lily Collingwood's performance of the many new male voices as well as the voices of the two new female supernatural characters was so well done and so believable. This book was like ear candy. It was very tastefully done. I highly recommend the audible version of Love Beyond Words. There was a moment that really moved me that I won't go into detail about because I don't like spoilers, but witnessing the lengths a character went through to save the man she loved...where she had to call upon all of her wit and acting skills was outstanding. This was truly a magical love story...love between two sisters, love between good friends, learning how to love one's self and an incredible happily ever after romance. Buy this audio book! Truly enjoyed the audible version. I had read the book but hearing it on audible was such a joy. Lily gave the characters new life. This book has several male characters and Lily did an awesome job with the changes in voice to match the character. The story was great and of course a HEA. Anyone who enjoys romance and time travel will love this audible version. I love your characters, your imagination and life lessons you engage within each story. This story helped me realize some of my own fears. Thank you for that.....Please write more, I’ll be waiting. What did I enjoy the most about this book? Everything! I got to tell you that Laurel's dating woes reminded me of my own that I had plenty of laugh out moments... I also enjoyed the mysticism of the 8 Druids. That is actually one of my interests(mystics and stuff that is) With Raudrich coming into Laurel's life. And with Marcus learning the full extent of his mission and of course, Morna who is always up to her old tricks. This made for an entertaining and special read for me. I enjoyed Love Beyond Words immensely! I love how us modern day women. Travel back in time and keep the men inline. Bethany knows how to bring you into the story and make you feel apart of it. Her time travel books are very well written. I just love all her books. Thank you Bethany for your books. Always enjoy Bethany's stories about Morna. Great book, now onto the next one in line. Enjoyed another time travel book. Hopefully this series will not end soon. The author is very good at capturing this reader's imagination.